200 library members participated in workshop of Hari Pemustaka Jakarta at Taman Ismail Marzuki, Cikini, Central Jakarta, Saturday (5/26).
" Beside as an appreciation to our library members, this event is also a way to motivate others to love reading"
This event was held by Jakarta Library and Archive Dept. (Dispusip) with theme 'Ketika Membaca Menjadikan Kebiasaan' (cultivating a reading habit) and enlivened by national actor, Iqbal Ramadhan. 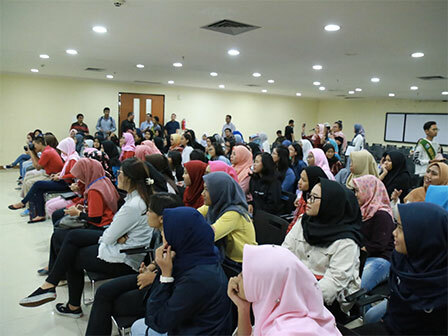 Jakarta Dispusip's Reading Interest and Library Development Division Head, Jamhuri Androfa said, this library workshop is the first workshop held by Jakarta Dispusip to motivate people to love reading. "Beside as an appreciation to our library members, this event is also a way to motivate others to love reading," he said, Saturday (5/26). Hopefully, he added, more people will be more interested to read by visiting library and have a reading habit as a lifestyle. "I hope people can take this reading habit as a part of their positive habits," he stated. Meanwhile, Iqbal Ramadan, the guest star, also said that people should arouse the intention to read from themselves first. Moreover, libraries in Jakarta are actually very supporting people to read. In other words, library facilities in Jakarta has getting better, more complete, wider, and more comfortable. Even Jakarta also has library application named iJakarta which can be downloaded from smartphone. "So, there is no reason for us to dislike reading. The youngsters even can make library as their hang out place to read," he mentioned.